I’ll be honest… when it gets to be this time of year, I get pretty tired of my winter wardrobe. How many different combinations of sweaters, jeans, and boots can a girl make?! That’s why this season, I have fallen in love with the sweater dress trend. 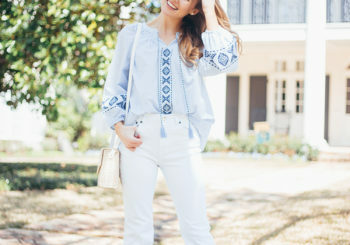 This silhouette allows me to feel cozy and feminine all at once, and is especially great for milder climates like Texas! My favorite way of styling the sweater dress? With over the knee boots! No one loves the super-pale leg look, and over the knee boots provide the perfect fix. Plus, they make the shorter hemline still feel wintery! This turtleneck cape sweater dress I picked up for my recent trip to NYC sold out in a flash, but you can sign up for a restock notification right where it says “Sold out in your size?” In the meantime, I’ve scoured my favorite sites to find the cutest sweater dresses of the season. Some even ship for free in time for Christmas eve! Click away below to your hearts content. I adore y’all! Sweater dresses are the best! I loved how you paired this one with that stunning cape and that cozy scarf.